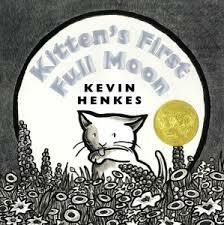 Our Cover to Cover Book of the Month for August is Kitten’s First Full Moon by Kevin Henkes. Silly Kitten thinks the moon is a bowl of milk. Follow Kitten on her adventures as she tries so many different ways to reach the milk. Kitten is so hungry and the full moon looks like a bowl of delicious milk! The moon may not be a delicious bowl of milk, but Kitten is not going to give up trying to pursue it despite her failed attempts. While reading Kitten’s First Full Moon, talk about a time when you or your child attempted to do something that didn’t seem to work out. How did it feel when it didn’t work out? What do you do when you’re faced with a challenge? Talk with your child about the importance of trying despite having feelings of frustration or fear. Give an example of a time that you persevered when faced with a challenge! Kitten is so brave and spiders are too! Especially the itsy bitsy spider! The Itsy Bitsy Spider song encompasses the concept of perseverance. Sing this song with your child and afterwards talk to them about how the itsy bitsy spider demonstrated bravery. Gardening is so much fun and a wonderful way to support your child in developing grit! The delayed gratification helps them develop the self-control needed for learning. Keep it simple and collect seeds from the kitchen— such as tomatoes, peppers, or avocados. Pima County Public Library even has a seed library! Learn more at https: //www.google.com/url?sa=t&rct=j&q=&esrc=s&source=web&cd=1&cad=rja&uact=8&ved=0ahUKEwjTnZ7JiZbVAhVP7GMKHcACB8UQFggmMAA&url=https%3A%2F%2Fwww.library.pima.gov%2Fbrowse_program%2Fseed-library%2F&usg=AFQjCNGdzt6N_yT4fv8Ba-Yl5eJAEM29xg. Join the Conversation! Send a picture of you and your child dressing up! Be creative! We can’t wait to see what you loved about Kitten’s First Full Moon!